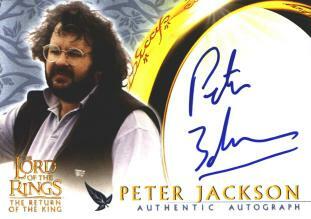 Topps is pleased to announce that Oscar-winning Director Peter Jackson will be an autograph subject in the upcoming Lord of the Rings: Return of the King Collectors Update. The Collectors Update will feature all-new photography, include more autograph subjects such as Executive Producer Mark Odesky and Sala Baker (Morannon Orc) and continue its run of unique memorabilia cards. Topps previous five Lord of the Ring products have been quick sell-outs as the film�s success, including 11 Oscars at the last Academy Awards, has created a cult-like following. Lord of the Rings: Return of the King Collectors Update releases June 28th.